Motorola launched their first Android One device in India – motorola one power priced at INR 15,999. Continuing with its 90 years of mobile legacy, Motorola brings to you its first ever Android One device in India, motorola one power. This smartphone offers users the smart, secure, and simply amazing Android One software experience. It delivers powerful features like smart camera, an octa – core processor, unlimited photo storage from Google Photos and a guarantee to deliver two years of the latest Android software updates as well as monthly security patches, all for INR 15,999. Tackling your to-do list has never been easier thanks to the 6.2 inch (15.7cm) 19:9 Max Vision Full HD+ display on motorola one power. Perfect for multitasking and holding in one hand, motorola one power’s wide view screen lets you enjoy a cup of coffee while watching your favorite show on your way to work. Never slow down with the ultra-responsive performance of the Qualcomm Snapdragon 636 1.8GHz octa-core processor. Answer emails, check movie times, make dinner reservations or update social platforms with ease. With its 64GB built-in storage, there is plenty of space for your apps, music downloads, favorite photos and videos. Go even further with expandable MicroSD storage up to 256GB. This powerful device has been designed keeping the current desires and needs of consumers in mind. To provide a consistent user experience and improved security, the motorola one power comes with Android One which has security built into its every layer. 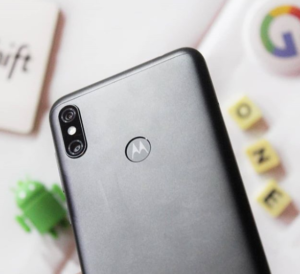 motorola one power will also help in keeping up with the latest versions of Android and help protect against online threats with monthly security updates2. The phone boasts an immersive 15.7cm (6.2 inch) Max Vision HD+ screen in 19:9 aspect ratio along with a storage capacity of 64GB expandable upto 256GB via a dedicated microsSD2 card slot to store all your photos, songs and movies. With 4GB of memory4 and blazing fast Qualcomm® SnapdragonTM 636 Octa-core processor, motorola one power responds to your touch in an instant and gives a seamless experience while playing games, watching movies, and doing other tasks on your phone. The 16MP +5MP dual rear camera system makes sure every shot is your best and the 12MP front camera lets you turn everyday selfies into extraordinary, both allowing you to add a blurred background effect in real time. The smart camera system with integrated Google Lens helps in recognizing and searching about the objects that you see. You can even dial a phone number simply by pointing the lens at the text in a sign or document. motorola one power on Android One also gets the best of Google right out of the box, i.e., comes with preinstalled Google apps such as Google Lens, Google Photos, Google Assistant, Google duo, and more. PREVIOUS POST Previous post: Ericsson and Celcom deal for LTE expansion in Malaysia.